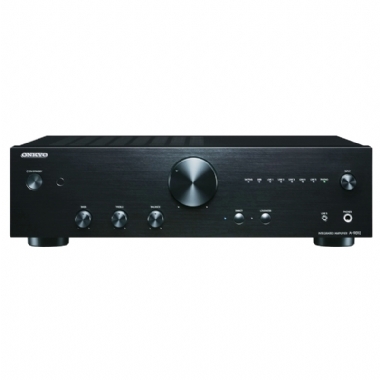 The latest addition to our Pure Hi-Fi lineup, the affordable Onkyo A-9010 Integrated Stereo Amplifier was tuned in the UK with specially modified circuitries and four audio-grade capacitors to deliver the warm, full-bodied sound European listeners prefer. A large transformer, discrete amplifier output stage, and unique high-current, low impedance circuitry enables precise control of the speaker drivers with minimal distortion, while a thick extruded aluminum heat sink keeps everything running cool. Other inclusions such as the MM phono equalizer, independent headphone amplifier, gold-plated speaker posts, and chunky knobs for volume, tone, and input selection reflect the quality of the product and add an appealing touch of vintage charm. If you’re looking for a sweet-sounding amp that will get the most out of your LPs and CDs without breaking the bank, the A-9010 is very much worth an audition.